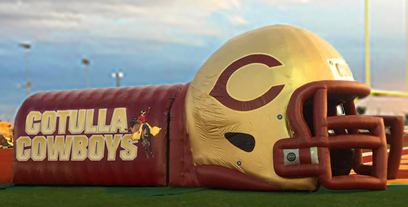 Cogswell Creations Inflatable Football Helmet Tunnel has bold graphics on an awesome design. Scroll down to see more photos and details on all four Helmet Tunnel packages. 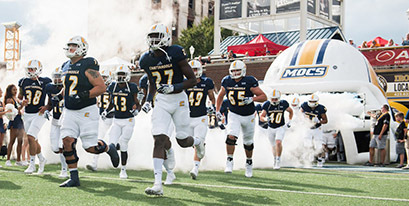 The Basic Football Helmet Tunnel (15’w x 15’h x 18’long) is the helmet only, with no extra tunnel. 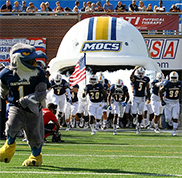 The Basic Helmet package includes choice of colors on helmet and facemask, snub plate above the face mask with team or mascot name, and custom logos on both sides. Also included is a 1hp blower, storage bag, tethers and stakes. 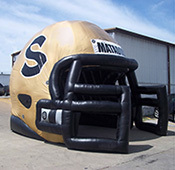 The Standard Football Helmet Tunnel (15’w x 15’h x 25’l) also comes with choice of colors on helmet, facemask, and a solid color, attached rear tunnel. Graphics on the Helmet are included in the Standard package too, and like all of our other tunnel packages, also includes blower, storage bag, tethers and stakes. 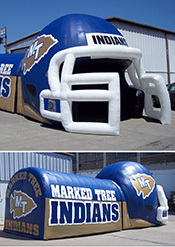 The Football Helmet SuperTunnel is our signature package (15’w x 15’h x 30’l). It comes with everything that the Standard Helmet has, plus extra length on the rear tunnel section, which provides plenty of space for the custom graphics placed there. It is an ideal choice for great visual impact in a manageable one-piece inflatable. 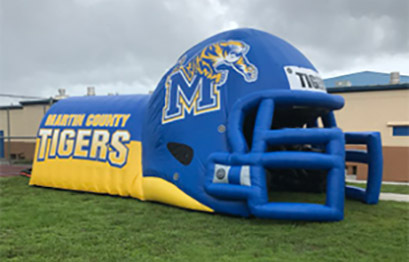 The Cogswell Creations Football Helmet Combo Tunnel is a two-part tunnel system - the Helmet with a short transition, joined by our Medium Blast Tunnel for a 39 foot total length. 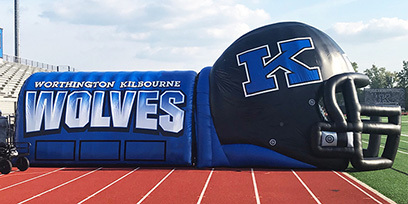 This combination is a popular choice for schools with diverse athletic programs, as the two sections are used together for an amazing display on the football field, then the tunnel can be used by itself for other sports and events. This package includes graphics on the Helmet, both sides of tunnel, and also on the rear velcro door flaps. Two blowers, two bags, and stakes and tethers for both tunnel sections are included. For more info on this combo see pricing. 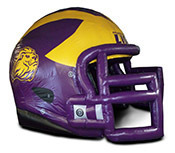 Cogswell Creations has the most appealing and affordable inflatable football helmet out there. Contact us today to discuss your project, and we will send you a free concept drawing with your colors and logos!